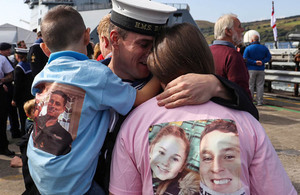 Support for personnel and their families. The new package will help the Armed Forces throughout their careers by offering a renewed focus on personal development and creating a support network for those living with significant illness, caring for others. The package will also ramp up support for those leaving the services, including a new transition programme and ID cards for all military leavers so their service to their country can be recognised easily. A new fund will be dedicated to supporting the careers of the spouses and civil partners of those who serve, in recognition of the vital role of families within the military community. This fund follows the success of the MOD’s Spouse Employment Support trial, and will facilitate access to vocational training and development opportunities, helping them enter new sectors or self-employment. "The bravery and dedication of our people is second to none. Whether they are in service, have served, or support the service of a loved one, we owe them a great debt of gratitude for their work in keeping this country safe. "It is only right that we give our Armed Forces every opportunity to develop their skills to reach their potential, while ensuring that their spouses and civil partners are just as valued for the part they play." By the end of 2020, all serving personnel will have access to their own Professional and Personal Development Plan – a new scheme that will enable them to hone the skills they need to succeed throughout their service, and equip them for the next stage in their careers. Providing an extra layer of care for those preparing to leave the military, the new Defence Transition Service will deliver specialist support for serving personnel who are most likely to face challenges as they adjust to civilian life. These individuals will be offered unique solutions to the challenges they face, including help with housing or employment. To further support the transition to civilian life, the Defence Secretary also announced that new ID cards will be available to military service leavers shortly. The ID cards will initially be given to everyone leaving the Armed Forces, and will give them instant recognition for their service to the country. Those who have already made the transition to civilian life will be able to apply for an ID card in 2019. The cards will allow easy access to the range of support available from the public and charitable sectors, including registering with their local authority for priority healthcare and housing. "The vast majority of those who have served in our Armed Forces go on to lead successful and rewarding lives, but it’s important we recognise that the transition is not always smooth. We are dedicated to upholding the support they receive while in uniform as they take this next step, and I’m delighted to be adding an extra helping hand to those most in need. "The challenges that service leavers can face are unique, and I want to make sure that they are fully equipped with the tools to thrive independently, whatever issues they face."